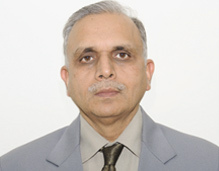 Dr. Arvind Gupta was Director General of Institute for Defence Studies and Analyses (IDSA) from 5th January, 2012 to 7th August 2014. He holds a Ph.D in International Relations from Jawaharlal Nehru University, New Delhi; M.Sc. in Physics from Delhi University. He was Visiting Member at the Tata Institute for Fundamental Research (1974-76) and served at the Oil & Natural Gas Commission (1976) and at the State Bank of India (1976-79) before joining the Indian Foreign Service in 1979. Retired from the Indian Foreign Service in 2013. Has worked in the Ministry of External Affairs in different capacities and served in diplomatic missions in Moscow, London and Ankara. Knows Russian too. Held the Lal Bahadur Shastri Chair on National Security at the IDSA from 2008 to 2011. Prior to joining the IDSA, he was Joint Secretary at the Indian National Security Council Secretariat from 1999 to 2007. During his tenure at the NSCS he dealt with a wide range of international and national security issues and participated in the various working groups and task forces set up by the NSC. He also worked with the Kargil Review Committee. At the IDSA he headed the South Asia and Internal Security Centres and edited the Institute’s flagship bi-monthly journal: Strategic Analysis. He has represented IDSA at several bilateral dialogues as well as international conferences. He lectures frequently at apex national training institutions. He writes in the media on foreign affairs & international security issues. His current interests include the international security issues, India’s foreign policy, energy security, climate change, technology & internal security issues. He has three books, several edited books and a number of academic publications to his credit. He has been a member of several task forces on issues such as space security, climate change, cyber security, nuclear disarmament etc. At The Cutting Edge, New Age International Pub. (P) Limited, 1996. Space Security: Need for Global Convergence, Pentagon Press, 2012. India in a Changing Global Nuclear Order, Academic Foundation, 2009. “India Africa Relations in the Changing Geopolitical Environment”, India and Africa: Enhancing Mutual Engagement, Pentagon Press, 2013. “South Asia in India’s National Security Strategy”, Grand Strategy for India 2020 and Beyond, Pentagon Security International, 2012. “Trends in Indian Foreign Policy”, Four Decades of India Bangladesh Relations: Historical Imperatives and Future Direction, 2012. “Need for a Space Security Policy for India”, Space Security: Need for Global Convergence, 2012. “India’s Experience in Dealing with Terrorism” The Terror Challenge In South Asia and Prospect of Regional Cooperation, 2011. “Emerging Trends in Afghanistan and Pakistan: Implications for Regional Security”, India-Russia Strategic Partnership: Common Perspectives, 2010. “Climate Change and Security: Exploring the Link”, Security Implications of Climate Change for India, 2009. “Reshaping India-Iran Relations: The Way Ahead” International and Regional Security Dynamics: Indian and Iranian Perspectives, 2009. “Crisis in the NPT, Counter-Proliferation Regimes and India’s Approach”, India in a Changing Global Nuclear Order, 2009. Will the Indus Water Treaty Survive? India–Pakistan Relations After the Mumbai Terror Attacks: What Should India Do? Bolster ties with Myanmar, The New Indian Express, May 25, 2012. Putin’s vision for Russia, The New Indian Express, May 14, 2012. Positive vibes with Dhaka, The New Indian Express, April 18, 2012. Resource crunch at MEA, The New Indian Express, March 27, 2012. India-Israel Relations: A Mutually Beneficial Relationship, The Jeruslam Post, January 9, 2012. Opening remarks at the Seminar "Early Years of Nuclear Cooperation and Non-Proliferation: A Dialogue on Nuclear Historicities"
Welcome remarks at book release "India’s Neighbourhood Challenges in the Next Two Decades"
"India-Japan Strategic Partnership: Prospects and Challenges", ICRIER Seminar on India Japan Relations, February 28, 2012. "Global Security and the Role of Ethics and Values", World Academy of Art and Science, October 2008.